One in five Americans plans to retire before age 65, according to a new study, and they're not just the ultra-wealthy. There's hope for everyone to bail out of the daily grind before age 65, if they adopt the behaviors and attitudes of these savers. "We had two hypotheses: They were privileged and ultra-affluent or wildly optimistic," says Catherine Collinson, president of the center. But just 52% of the future early retirees had a college degree, and 49% reported an annual household income of less than $100,000. They are equally divided among men and women; half are over age 40. "They are far more likely to be like the 'Millionaire Next Door' than a Bill Gates or Warren Buffet," Collinson says, referring to the 1996 best-selling book that found many U.S. millionaires lead relatively modest lifestyles. The future early retirees weren't pathological optimists either. The study authors extrapolated from the data on their savings behavior, and found they were actually "well on track to meet their goal," she says. So who are the future early retirees, and why are they successful? They started saving earlier -- age 25, on average, versus age 30 for their later-retiring peers. They contribute more to their company plans -- 10% of income on average, versus 6% for other respondents. They are much more likely to save for retirement outside of workplace plans -- 69% versus 60% of those planning to retire after 65. They're also luckier: While about three-quarters of those surveyed enjoyed access to a company 401(k) plan, the future early retirees were more likely to have company-funded pensions as well (25% versus 14% for those retiring after 65). Planners also score high in conscientiousness, frugality and self-control. One reason is that their planning allows them to see potential expenses down the road and allocate money for them -- so they have a better handle on their spending today. Thus they'll whip out a coupon in the grocery store, knowing that small savings will add up over time for their future goals. Steve Spiller, a marketing professor at UCLA, has studied the concept. Planners "can see ahead and realize they are bumping into [spending] constraints, whereas people who are not planning go about their merry way until they're just about to run out, and think, 'Oh, if I spend this dollar now, I can't spend this tomorrow,'" Spiller explains. The future early retirees also appear to be more self-reliant -- nearly two-thirds say their primary source of income in retirement will be their own retirement savings -- versus 54% of those who plan to retire after 65. They also seek out information on retirement. They're much more likely to spend time on financial information websites, and to talk with friends and family about their plans. In addition, they also responded to shifting economic times. Asked how their savings habits had changed since the recession, 45% said they were saving the same and 26% said they were saving more. "What the data implies is they have chartered a course and are sticking with it, and adapting to difficult conditions," Collinson says. 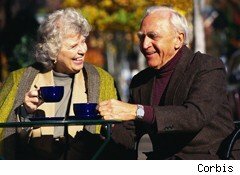 The study authors decided to spotlight future early retirees as an inspiration amid economic gloom and doom. "Hopefully people can look to them as role models in their own planning and saving, and may become future early retirees themselves -- or at least retire sooner and on better terms than they expect," says Collinson.